The best part: they're all under one roof! There's something about Fairview that has gotten people from all over the Metro flocking to it lately. True enough, it's got a lot to offer: friendly people, lush parks, great shopping, and food, glorious food. The many treats to be had in Fairview is definitely worth the drive along Commonwealth, and you're missing a lot if you won't check out their food scene. In fact, you can spend a whole day hanging out at SM City Fairview with your family and friends, just trying out what their various restaurants have to offer! 1. Kare-Kare from Cabalen: With its thick sauce and generous servings of meat and vegetables, Cabalen's version of this Pinoy classic is a must-try. 2. Crispy Boneless Pata from Mesa: A Filipino feast won't be complete without a sinfully good hunk of pork, and this dish from Mesa fits the bill perfectly. 3. Seafood Paella from Eduardo's Peri-Peri Flame-Grilled Chicken: Eduardo's paella is really underhyped. Pair it with this resto's famous grilled chicken for an unforgettable meal! 4. Roasted Chicken from Kuya J: A perfectly roasted bird is another Filipino handaan must-have, and Kuya J's got a tasty, juicy one on their menu. 5. Shrimp and Pomelo Salad from My Thai: You can order this refreshing Thai staple as an appetizer to share with your group, or have it as your main course. Either way, just one bite won't be enough! 6. Three-Cup Chicken from Mann Hann: If you've yet to taste this classic Chinese dish, Mann Hann's ultra-savory version is a great one to try out. 7. Signature Beef Noodles from Ersao: In need of a quick, tasty tummy-filler? Ersao's beef noodles is a fail-safe option. Pair it with their drinks for a complete meal! Craving for some hefty, filling fare? 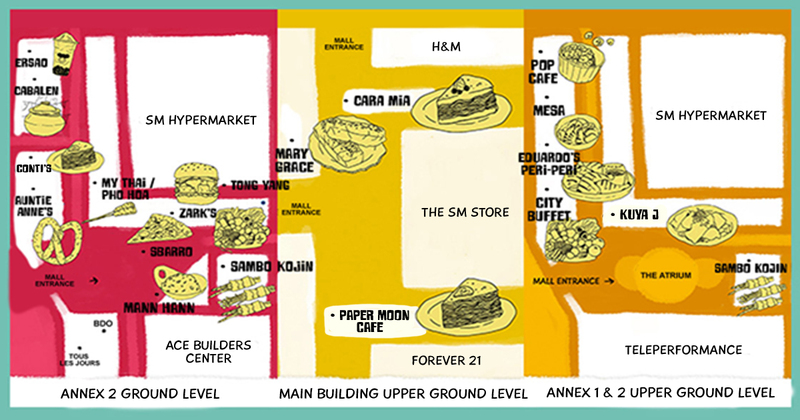 SM City Fairview's got some great restaurants ready to satisfy the heartiest of appetites. Whether you're in the mood for an eat-all-you-can buffet or hankering for a juicy burger, they've got it all for you! 1. Japanese Yakiniku and Korean Barbecue from Sambo Kojin: Make sure you've got a lot of room in your tummy when you visit Sambo Kojin, as you'll want to try everything in their buffet! Don't miss their U.S. beef, fresh seafood, skewers, and their bacon rolls. 2. Spicy Crab from City Buffet: If you're looking for a buffet that won't break the bank, you should visit City Buffet and aim for a taste of their spicy crab. Trust us, this one's worth it! 3. Shabu-shabu, Sushi, Maki and Barbecue from Tong Yang: Here's another buffet place where you can fill your tummy to the brim. Tong Yang's known for their shabu-shabu and barbecue, but their other ready-made offerings are also must-tries. 4. Ham Pineapple and Pepperoni Stromboli from Sbarro: If you're not familiar with the stromboli, think of it as a pizza roll, with the toppings inside. Don't miss Sbarro's Hawaiian-esque version, which will make you say "aloha!" 5. Tomato and Herb Perfect Plate from Mary Grace: Get major bang for your buck with Mary Grace's perfect plates, which has salad, pasta, and a slice of one of their famous cakes. Pair it with one of their soups—their Summer Squash Soup is a tasty, hearty option. Don't forget to leave some room in your stomach for dessert! These SM City Fairview restaurants have enough options to make any sweet tooth happy. 1. Mango Passion from Cara Mia: This bestselling gelato cake is a mango lover's dream. It doesn't hurt that it's Instagram-worthy, too! 2. 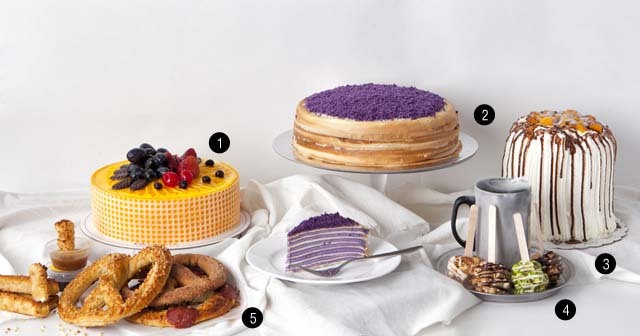 Ube Mille Crepe from Paper Moon Cafe: Paper Moon's iconic crepe cakes got a Pinoy makeover! Who knew the classic ube was the only thing needed to take this dessert from heavenly to downright orgasmic? 3. Mango Bravo from Conti's: This cake needs no introduction. It's impossibly tall and challenging to slice, but boy, the struggle is definitely worth it every single time! 4. Pop Rocks from Pop Café: Have a unique dessert experience at Pop Café, where you can dip popcorn lollipops in liquid nitrogen before gobbling it up. It's absolute fun for the whole family—just don't dip your hands in the liquid nitrogen and you'll be fine! 5: Almond Pretzels with Caramel Dip from Auntie Anne's: Looking for a treat you can eat on the go? Auntie Anne's pretzels are always a good decision. Pair it with the caramel dip for a quick, sweet snack! Ain't this a drool-worthy spread? If that didn't get you excited to pig out at SM City Fairview, we don't know what will! Visit SM City Fairview's Facebook page for more information. This article was created by Summit Storylabs in partnership with SM City Fairview.